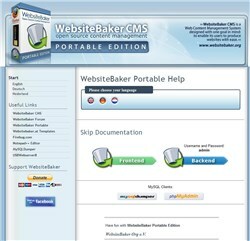 The WebsiteBaker portable project combines the easy to use content management system WebsiteBaker with the out of the box server solution USBWebserver8. This allows you to test and run WebsiteBaker in a local test environment by one click. The server starts and your default browser will show the WB-Portable startpage. Settings > Default Settings > Language. Please visit the official WebsiteBaker Help site to learn more about WebsiteBaker. If you have any problems or questions, please do not hesitate to visit the WebsiteBaker Forum. There exists about 100 WebsiteBaker templates which can be used free of charge. Check out the official WebsiteBaker Template Repository, or use the German Template Search to find your template! Modules allow you to extend the capabilities of WebsiteBaker. Check out the official WebsiteBaker Add-ons Repository to find the modules available. Thanks to Christian Sommer (aka doc) for the initial idea. Graphics and logo design by Christian M. Stefan (aka Stefek). Thanks to the WebsiteBaker Community for the support and encouragement to make this project happen Donation-Link. Thanks to all the people who supported this project, especially Martin Freudenreich (aka mr-fan) for starting the project.